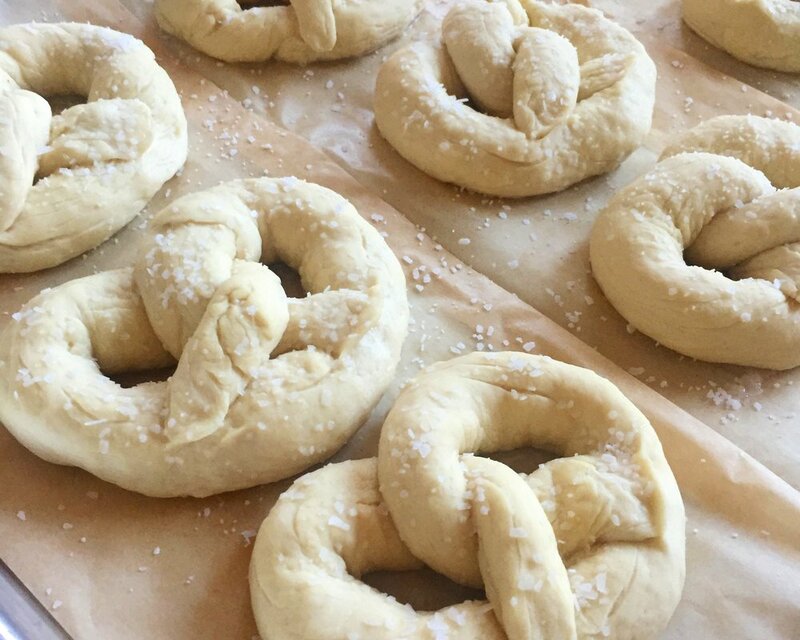 Soft pretzels are somewhat time consuming but fun to make, especially if you have always wanted to try making bread but want an easier entry-level project. These buttery pretzels a perfect snack to keep around and are delicious served alone or with mustard. 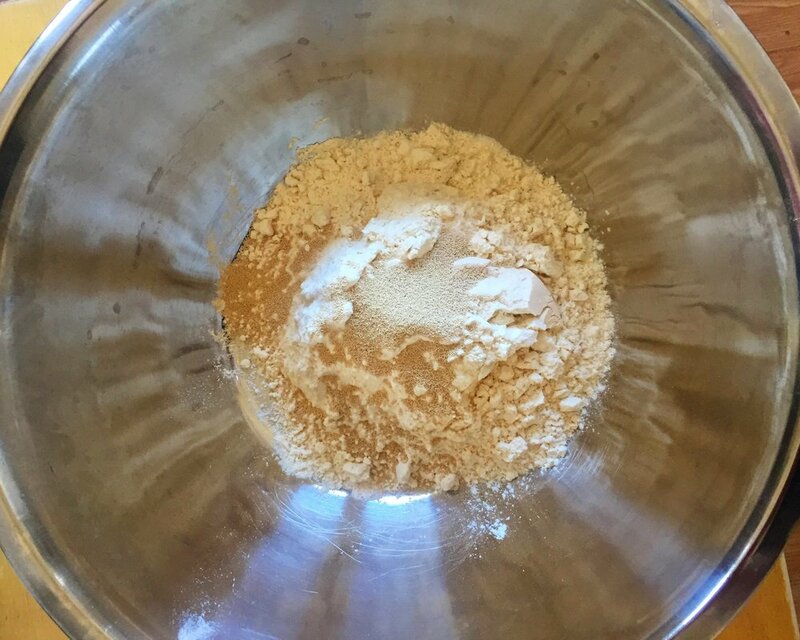 Put all of the dough ingredients in a large bowl, mixing the dry ingredients before adding the water. Once water is added it gets sticky and more difficult to evenly distribute the ingredients throughout the dough. 2. 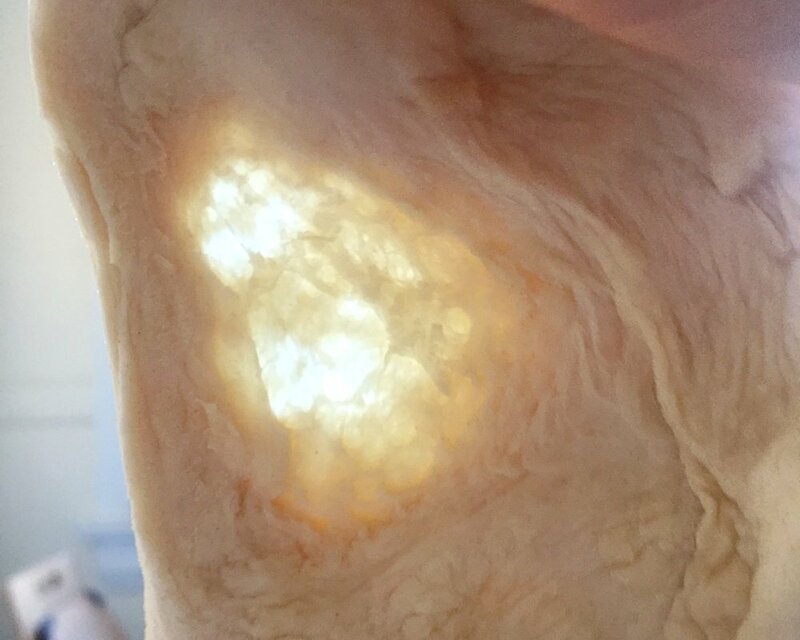 Knead the dough by hand for 10-15 minutes, until it is smooth and soft. 4. 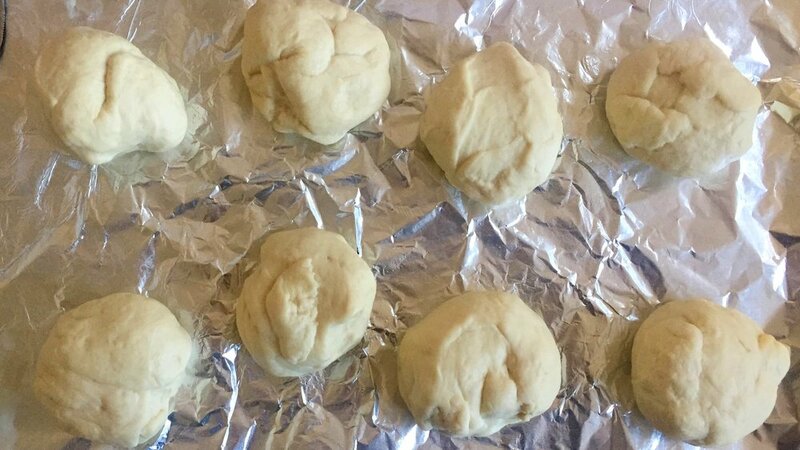 Once you have judged that the dough has been kneaded enough, put it in a sealed plastic bag (leaving room for the dough to expand) and allow it to sit for 30 minutes. 5. While the dough sits, prepare the topping. Combine the baking soda and boiling water, making sure the baking soda is fully dissolved. Set to the side and allow to cool so that it is lukewarm or cooler. 6. Preheat the oven to 475° and line a baking sheet with parchment paper. Put on more butter than you think you need, making sure it is thoroughly greased so that the pretzels will not stick. 7. Once the dough is done sitting, transfer it to a lightly greased surface and divide into eight even pieces. 8. Allow the pieces to rest uncovered for five minutes. 9. Roll each piece into a rope about two-two and a half feet long and twist each one into a pretzel shape. 10. Put four pretzels into the pan with the baking soda mixture at a time, spooning the mixture over them so they are all evenly coated. Allow them to sit in the pan for two minutes and then do the other four. The coating gives the pretzels a golden-brown color when they bake. 11. Transfer the pretzels back to the baking sheet and sprinkle them generously with kosher salt. Let them sit for another ten minutes, uncovered. 12. Bake the pretzels for 8 minutes, or until they are golden-brown. 13. Spoon or brush the melted butter over the pretzels, allowing each one to soak it in. The butter gives the pretzels a shine and much of their flavor.